At long last, the Kershaw Cryo. This is another one of those Hinderer/KAI collabs that tantalized knife collectors back at SHOT Show 2011 (or was it 2012? the years just blend together). Whichever year it was, we waited what seemed like forever for this little knife. Finally, after eons of patiently waiting, this much anticipated design hit the shelves. Reactions ran the gamut from exalted praise to abject horror. I’m not going to lie, the mixed reviews turned me off from checking out a knife I was initially interested in. But then I realized, “Hey, that’s what I do – I check out knives.” And I’m guessing people want a review on this one, so I finally picked one up. So lets get on with my review of the Rick Hinderer designed Kershaw Cryo. The Cryo has an overall length of 6.5″, it features a 2.75″ blade, and it weighs 4.2 ounces. This is a small (albeit chunky) folder primarily meant for EDC. I’ve been carrying mine as an EDC knife, and it gets the job done. Guys who like larger knives will probably want something else, and guys who like lightweight knives will also probably find something lacking in the footprint of the Cryo. Personally? I don’t mind the weight and have a soft spot for small knives – this made for a reasonable EDC in my book. The blade is an attractive drop point design, reminiscent of Rick’s other creations (and collaborations with KAI, including the ZT 0550 and ZT 0560). You have a good amount of belly, a small swedge, and a high hollow grind. The Cryo has a fine tip and gets reasonably thin behind the edge. It makes for a capable slicer when working with materials like leather and cardboard. The entire knife (blade and handles) have been given a gray titanium carbo-nitride coating. It’s an attractive finish and a refreshing departure from Kershaw’s standard value folder formula of a black FRN handle with a plain bead-blasted blade. Kershaw went with 8Cr13MoV stainless steel for this knife. 8Cr is a Chinese stainless and the choice makes sense when you realize the entire knife is made in China. Given the price I don’t have a problem with the steel or the origin of manufacture. 8Cr13MoV is capable. I cut about 60 pieces of 3/8″ manilla rope with the knife before moving on to several cardboard boxes. At that point the edge was more or less done, but it quickly came back to life with some swipes on a diamond stone. I then carved some 2x2s with the Cryo, testing edge strength and the overall capabilities of the knife. Then I did it all over again because I lost my original video footage (d’oh!). All things considered, the 8Cr held up well – it’s about as good as it gets these days with a $30 folding knife. The Cryo features full stainless steel handles. The gray handles are mated to contrasting black hardware. No doubt the stainless steel construction adds greatly to the weight. I can’t help but wonder what this knife would have been like with a G10 handle scale (a la Hinderer’s real knives) or maybe even G10 and stainless steel liners. Either way construction is solid and reasonably well finished. It’s a flow through design and the decorative black pillars and lanyard tube look nice against the gray steel. All the corners have been more or less rounded and everything lines up. I have no major issues with the way this handle has been constructed. For light use the Cryo feels pretty good in hand. This is a smaller knife, and I was able to just get a 4 finger grip on it. I take a large glove so I think most people will be able to comfortably grasp the knife for daily tasks. The steel handles are fairly slick, but this is a little EDC blade, and jimping top and bottom side adds a lot of traction in hand. Under harder use (stuff like cutting rope and carving wood) the knife isn’t particularly comfortable, but for more EDC type tasks (cardboard, plastic, etc) the ergonomics were fine. If you are going to sit down and do half an hours worth of cutting like I did you will definitely notice a few hot spots, how rough the jimping is, etc. So it’s not the most comfortable knife, but for casual use and the occasional chore you should be able to get stuff done without huge issues. The pocket clip is a blackened low rider clip allowing for 4 corner carry. The clip is small and discrete, and it inserts and removes easily from the pocket. This is a relatively new pocket clip design for Kershaw, and I happen to like it. The Cryo carried well considering and was there when I needed it. As for the 4.2 ounce carry weight, well, I’m sure some will notice the Cryo’s presence more than others. I found that I didn’t like carrying this knife with dress pants, but had no issue with shorts or blue jeans. It’s one of those “your mileage may vary” things, so please plan accordingly. The Cryo features both thumb studs and a flipper, and the knife makes use of Kershaw’s Speedsafe assisted opening technology. The flipper is nice and easy to reach, and the blade springs to life with very little effort. The thumb studs on the other hand are almost impossible to use. They really serve no function. I think Kershaw should have spent some more time on this, either figuring out how to make the thumbstuds usable or removing them from the finished knife. As it stands, it seems half baked, like something was lost in translation from design to realization. As for the Speedsafe, I happen to like it on this knife. The Cryo is small and can be difficult to orient in your hand, so a spring assist to ensure deployment every time works well for me. Lockup is accomplished via a stainless steel framelock. This pays homage to Rick’s custom and production titanium framelock knives. Lockup is early and relatively secure. Sometimes my knife gets a little side to side play and requires a twist of the pivot screw – not a huge deal. There is also Hinderer a lockbar stabilizer installed on the knife to prevent over extension of your steel framelock. This is a cool high-end feature found on knives like my $400 Strider and of course the ZT/Hinderer collabs as well. On paper the Cryo seems like a decent little knife – and it is. It’s small, cool, and functional. It comes with acceptable blade steel, a nice pocket clip, and fast action. I don’t regret the purchase, and think the knife is fairly priced at $32. It’s not amazing, and certainly isn’t a hall of fame budget knife like the Spyderco Tenacious, Kershaw Skyline, or Ontario Rat 1, but it’s a unique knife for Kershaw, is decently made, and I’d generally say it’s a win. That said, the knife is a little rough around the edges, and I feel like it could have been so much more. For example, the blade is massively off center (not rubbing, but almost), the thumb studs are useless, and at 4.2 ounces, well the knife is heavy for what it is. There just seems to be a lack of attention to detail that slightly derails the knife. I find it especially ironic considering that the biggest selling feature is the Hinderer name – a name built on extreme quality and high end knives. I’m not expecting a $30 XM-18, but no doubt people interested in a Hinderer designed knives are “knife people” – not the average person contemplating the purchase of a $30 pocket knife at Wal-Mart. Real knife people care about stuff like material selection, fit & finish, and functional design. Perhaps this knife could have played in the $50 price point and appealed more to higher end enthusiasts as well. So a big part of me wishes Kershaw spent some more time on this one – ironing out the kinks, making it in the USA, and delivering something of real substance. Sure, it may have to retail for $50+ instead of $30, but I think people would pay for it, and the knife would have real staying power. As it stands I view the Cryo more as a flavor of the week than a timeless tool that will become a new benchmark in its class. In conclusion, I want to emphasize that the Cryo isn’t a “bad” knife. $30 isn’t much money for a folder these days, and I enjoy the knife for what it is. But I still can’t help but wonder what it could have been. 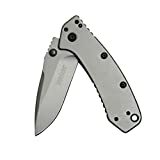 I recommend purchasing the Kershaw Cryo at Amazon or BladeHQ. Please consider that purchasing anything through any of the links on this website helps support BladeReviews.com, and keeps the site going. As always, any and all support is greatly appreciated. Thank you very much. 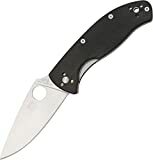 I found the Spyderco Tenacious when I was looking for a good sized EDC knife on a budget. I did some research and saw that the Tenacious ticked a lot of my boxes. At the time I was interested in a knife with a full flat grind, a large plain edge, G10 handle scales and pillar construction. The Tenacious had that and more – all for around $30. So I ordered the knife and had it at my door a couple days later. The following are my thoughts on the Tenacious after using it as a daily carry for several months. The Tenacious has an overall length of 7-3/4″, a 3 3/8″ blade, weighs 4.0 oz, and is made in China. The blade is not only long but it is fairly wide (from edge to spine) at almost an 1.5″ inches. This is a large knife for EDC (Every Day Carry), and people contemplating the Tenacious for that use may prefer it’s smaller brother, the Persistence or the Ambitious. The leaf shaped blade of the Tenacious is made of 8Cr13Mov Stainless steel. 8Cr13Mov is a more inexpensive steel that is comparable with Aus 8. However, Spyderco does an excellent job with the heat treat on this steel and my experiences have found that 8Cr13Mov sharpens well and holds a good edge. That said, compared to harder, more expensive steels you will have to sharpen the knife more frequently. The handle is a of pillar construction, which I really like because it makes the knife easy to clean. The handle is layers of steel with G10 scales. The steel has been milled out to reduce the weight, which is a great touch that I love to see on a cheaper knife. The G10 is lightly textured and feels good. It isn’t super abrasive so your pockets will be spared, but it offers nice tactile feedback. I haven’t had any problems with the knife slipping out of my hand, probably because the ergonomics are so good. The G10 has been contoured around the liner lock and there is very good jimping on the thumb ramp and the lock, this makes the knife very easy and comfortable to use. The ergonomics on the Tenacious are quite good. It has a pretty big handle and it has been well designed. My palm fits nicely and the corners have been rounded slightly for comfort. Also the knife is designed to provide the user good traction, which I find to be important for a mid sized folding EDC knife like this. Since it is a cheap knife, I have a tendency to have it do my “dirty work” that I wouldn’t subject some of my more expensive knives too. The large thumb ramp and jimping really helps keep your thumb in place and maintain control when putting some power behind the blade. I’ve used this knife pretty hard and “Tenacious” is an apt name because it keeps on ticking. Pocket clips can be a problem with expensive knives, let alone cheap ones, so I was really pleased with the clip on the Tenacious. It’s a signature Spyderco Hourglass shaped clip that provides good pocket retention without shredding your pants up. Also the clip is mountable on all 4 corners of the knife, so you can carry this knife in your left or right pocket, tip up or tip down. As a lefty on a budget, I loved this feature. The knife rides pretty low in your pocket. I will say that my clip had a tendency to come loose until I hit it with some lock-tite. My guess is that you are going to want to do the same. The deployment on this knife is very nice. The thumb hole (“Spyderhole”) makes it easy to access the blade with bare hands or gloves – in rain or shine. The action is smooth, thanks in part to phosphor bronze bushings. The bushings on this knife are apparently pretty thin, but I’ve been flicking this knife open for months and it still deploys very smoothly. Also, the lock on this knife is very solid. The Tenacious uses a thick liner lock that bites deep into the blade. I detect zero up and down movement when the knife is locked and a tiny amount of side to side movement. So one thing that kind of concerned me about this knife was that it was made in China. At the time the Tenacious originally came out, there was a lot of stigma regarding Chinese manufacturing and Chinese knives. Today, with the advent of high end Chinese knife manufacturers like Reate, there is less of a concern, although certainly some of that original stigma still exists. I will say that the build quality of the Tenacious is impressive considering the price. It’s not the best finished knife in my collection – there are some minor quibbles here and there (the grind on the bevel is a little sloppy, the G10 scale is milled out a little too much next to the lock bar, etc), but all in all I am pleased with the fit and finish and whoever manufactured this for Spyderco did a good job. As I turn to my final remarks on the Tenacious, I think we should consider the topic of “value” – as that often plays in to the commentary on the Tenacious, and many consider this to be a “value” knife. To be honest, I think the knife is well priced right around $30. It’s a good amount of knife for the money, it’s well designed, the materials are adequate, the fit and finish is adequate – I really cant complain. That said, I would likely not pay $50, or $75 for this knife, and think it is priced appropriately for what it is. The Tenacious rounds out Spyderco’s product line nicely and is an affordable knife that has all of the design elements and features Spyderco is known for. I like the Tenacious and recommend it for someone seeking an affordable larger EDC knife, or a hearty utility knife that can be used hard guilt free. I recommend buying the Tenacious at Amazon or BladeHQ. Buying anything through any of the links on this website helps support BladeReviews.com and keeps the website going. Any support is greatly appreciated. Thank you very much.